Back when cell phones had antennae, banana clips clasped the locks of every sticker book-toting tween and office-dwelling adult. That relic of '80s-'90s nostalgia — the perfect no-fuss hair accessory — resurfaced a few days ago at Alexander Wang's Fall '18 runway show. Models strode through a cubicle-lined runway, their hair tightly fastened with the silver "ALEXANDER WANG" emblazoned claw clips. "This is Alexander Wang's take on the power woman. It's inspired by the '80s, when we first saw female empowerment in the office," said hairstylist Guido Palau backstage. "At that point, they were kind of new, and then they had a bad connotation… we're sort of seeing them again through a different eye." Slicked-back hairdos elevated the sleek silhouettes and severe looks on Wang's runway, an edgy take on the modern CEO/HBIC and an appeal to stylish comfort. Following closely behind fellow emblems of feminine confidence — the scrunchie and the choker — the banana clip trend-to-be has long been in the works and under our nose. Consider Jennifer Lopez's effortless up-do in 2011. 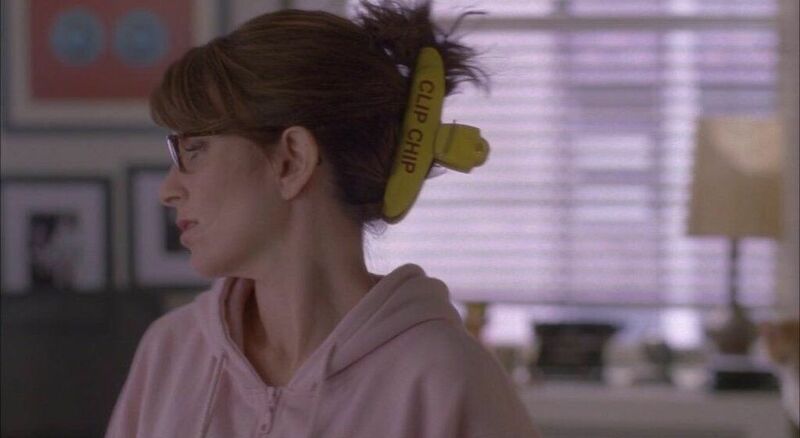 That same year, Tina Fey's character on 30 Rock, an amusingly neurotic television writer named Liz Lemon, reinvented the hairstyle by pulling her hair back with a chip clip. Thus paving the way for actress and American sweetheart Kristen Bell to don a banana clip on the red carpet last year. Shortly after Bell's mix of couture and comfort, Miguel released his album, War & Leisure, which includes the song, "Banana Clip." Coincidence?